Keeping your cat active can help it burn calories and use muscles, tendons and ligaments that may often be seen catnapping. Burning calories is important for your cat. The more your cat moves and exercises, the more calories it will expend during the activity. Exercise will help to off-set the naps taken in your favorite chair and help to prevent obesity. Exercise methods your doctor recommends will depend on your cat's current level of activity, health, age and medical condition. Indoor cats probably need more encouragement and support with exercise. 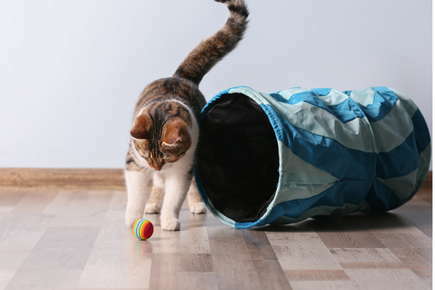 You'll want to consider several methods to get your cat moving and grooving. Then, you'll want to shake up the sequence when you play. Pet Weight Loss by veterinarian Jan Becker discusses pet exercise for owners of cats and dogs. "Cats on the other hand can be a bit harder to exercise," says Dr. Becker. Get your cats moving with cold laser lights flashed onto objects to interest them - but not in their eyes. Wiggle stuffed animals, move them sneakily to get your cat's interest and increase the attraction of pouncing, sneaking, hiding or batting at the soft toy. Rope, shoelaces, yarn and ribbon - Cats typically love to play with long stringy items like yarn and ribbon, but Dr. Becker warns owners to beware of these. Owners must be vigilant of linear products or toys and use these only with supervision. The string can easily get caught or tangled with your cat's tongue inducing them to swallow it. Unfortunately, when this happens it can be "very serious or even fatal, if surgery is not performed to remove the object. Flashlights - Everyone in your home has a flashlight for emergency use. Make sure your cat has one too. When playtime approaches, pick up your cat's flashlight, ruffle its coat and scratch its tummy. Move your arm behind you when the cat's awake and shine the flashlight beam two feet away from it. Your cat will see the light and want to pounce on it. As your cat moves toward the light, gently shift the light from place to place. Bags - Paper grocery bags and gift bags make crinkly sounds that consistently get cats' attention. Boxes - If your cat has a particular box it enjoys, encourage playtime with a small ball to bat from corner to corner of the box. Straws - Tying a drinking straw into a knot and dropping it in your cat's line of view can start playtime. Your cat will bat it from place to place, sliding, stretching, rolling and tumbling on floor or bed. Socks - Add a bit of catnip, a bell or small ball to a spare sock. Secure tightly and swing or drag gently so your cat will follow. "Catnip will often get a cat running around," says Dr. Becker. Not all cats are affected by catnip, but for those that are, keep in mind that catnip must be used in moderation. For cats, the nip is a stimulant that may cause digestive upsets." Bottle caps - These caps are typically received on five-gallon water bottles that arrive at your doorstep by delivery. The caps are larger, a firmer plastic and often times have the plastic neck still attached when you remove them to up-end your water into the household dispenser. Your cat will enjoy batting the cap around a smooth surface. Walk on leash - Cats can be walked on leash and will probably "walk you" advises Dr. Becker.